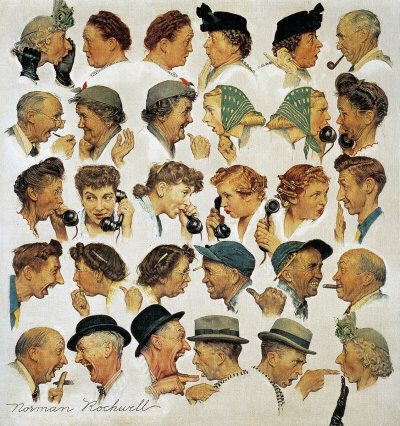 The Gossips, a Norman Rockwell painting, appeared on the cover of The Saturday Evening Post published March 6, 1948. This is another favorite of Rockwell collectors, a classic enduring image of the world Rockwell painted. An alternate title is Chain of Gossip. This painting was Rockwell's 252nd overall out of 322 total paintings that were published on the cover of the Saturday Evening Post. Rockwell's career with the Post spanned 47 years, from his first cover illustration, Boy With Baby Carriage in 1916 to his last, Portrait of John F. Kennedy, in 1963. This was also the second cover for The Post in 1948. In 1948, there were seven Norman Rockwell Saturday Evening Post covers published. on page 176 and color plate 19 of Norman Rockwell, A Definitive Catalogue by Laurie Norton Moffatt. Several studies also appear in The Norman Rockwell Catalogue on pages 176, 177 and 178. In this painting, Norman Rockwell shows us how a stray bit of gossip can come back to haunt the person who starts it, as well as the person who it is told on. The story starts in the upper left hand corner with this lady telling a bit of gossip about Rovkwell. The gossip was not true. The fourteenth time the gossip is told, it falls on the ears of the person who knows it is false. In the fifteenth scene in the painting, Norman Rockwell confronts the lady who started the gossip in the first scene. You can see the anger with which Rockwell confronts her. He is seething before he speaks to her and lets that ire out on her. You can also almost hear the woman exclaim "Oh, my!" The Gossips was only one of 322 Norman Rockwell Saturday Evening Post covers; Here is the list of Norman Rockwell Saturday Evening Post cover illustrations. This story actually happened, though we do not know exactly how many ears and mouths the rumor passed through before it got back to Rockwell. After this picture appeared on the cover of the Post, the woman who started the gossip not only never spoke to Rockwell again, she actually moved away. The lady in the middle row, both the second and third face from the left, is portrayed by Mary Rockwell, the artist's second wife and mother of his children. And, of course, the artist himself, Rockwell is on the bottom row, the second and third faces from the right. Does anyone know the names of any of the other models? Do You Have A Great Story, Opinion Or Contribution About The Gossips?